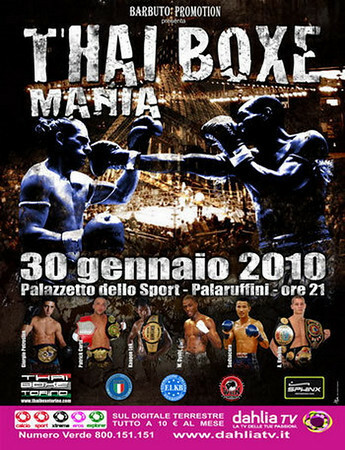 Coming January 29, 2011 to Palezzo Dello Sporto, Torino, Italy is theThai Boxe Mania 2011 Edition. Some very big names will be featured on this card. Giorgio Petrosyan the newly crowned K-1 MAX king will fight long time standout Yohan Lidon who has fought among others Yodsanklai Fairtex. Petrosyan has in the past beaten Kem Sitsongpeenong albeit under K-1 rules. Abdallah Mabel fresh off a Lumpinee Stadium title match in France will return in action against Armen Petrosyan who has always impressed in his fights. Mabel recently lost a decision to Saiyok in a tough fight for a Lumpinee welter weight title. Fabio Pinca who has busied himself recently in Thai Fight and will be fighting in the final is set to fight Sudsakorn Kliminee. Sudsakorn has been known to fight with razor’s edge timing that always makes fights with him entertaining. Also expected to participate is Andrei Kluebin who has in the past held 7 world titles. And Kaoponlek the Kombat League Intercontinental champion and past Lumpinee stadium champion. Kaoponlek also qualified for the Contender Asia by fighting for and winning the Italian qualifier. More fights are yet to be confirmed but this an incredible looking start on what could be an even more incredible final card. More information can be found by going to the official Dahlia TV site. ~ by fatsoking on November 22, 2010.
suds better keep his hands up, i really want him to win.